This Luxury waterfront property has views from many areas of the house that just simply take your breath away. Having a northerly aspect it is constantly bathed in sunshine and you’ll love the ambience. 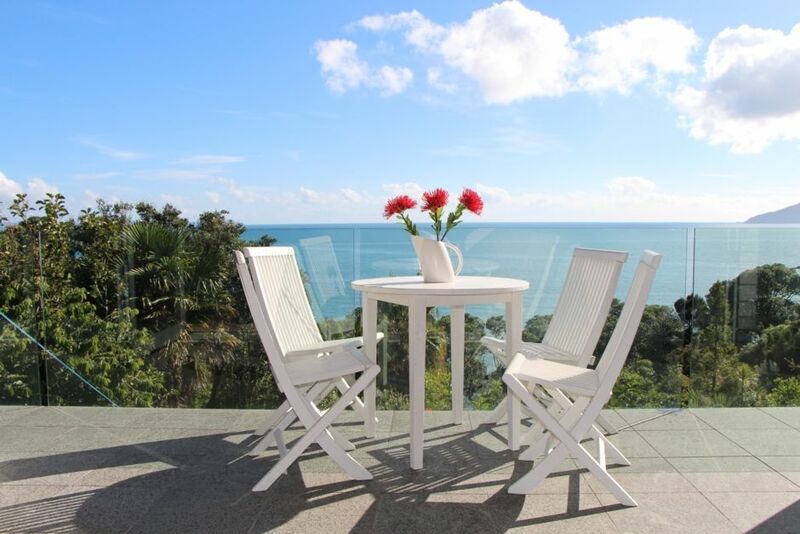 Adjacent to the beautiful waters of Cable Bay, Coopers Beach and Doubtless Bay, and a garden path meandering down to the water below, this is an idyllic holiday escape. A private beach at the bottom of the garden and beaches to left and right is the perfect place to idle away the day in the shade of the ever present Pohutukawa trees. You can even have a barbeque on the beach as the present owners do. Don’t hesitate if this is what you have been looking for, as this property books quickly. The main dwelling has four very generously bedrooms offering bush and sea views and all day sun. There are three stylish, modern separate bathrooms, together with a fantastic large modern kitchen, which will ensure you will always be very comfortable here. The occasional chilly Winter’s day is not a problem. Enjoy the sunny lounge then sit back, relax, and enjoy all that this quality home has to offer. This Gem is stunning in Winter as in Summer with above average warm days at most times of the year. Bright, fresh stunning days offer a lovely Winters Retreat. Also take advantage of the fabulous numerous beaches close at hand along with stunning scenic walks. Only 5 minutes away for those keep fitters you will find a well equipped gym, bowls, golf and tennis clubs. At Cable Bay Store you’ll find the far north’s best ice creams on offer. Beautiful Coopers Beach, just two minutes’ drive away, has a well stocked Four Square and a small shopping centre for all your grocery and personal needs. A short drive is Mangonui Township, where you’ll find the world famous fish and chip shop, along with a range of other cafes, takeaway bars, gift shops and general stores. $2000 damage bond payable minimum 2weeks before rental. Note: 1 double bedroom has king single beds. Only the bedrooms are to be used for sleeping. Additional persons additional charge. Numbers of occupants will be monitored andamp; all guests must be named. Also copy of driving licence andamp; passport will be required at time of confirmation. BBQ to be cleaned or deduction of $80 from bond. Non smoking property. Cigarette butts around the property will be charged for clearing up.